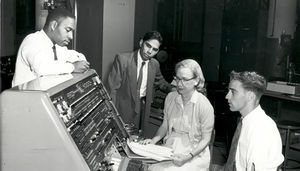 A 1962 Institute of Radio Engineers (IRE) Fellow “for contributions in the field of automatic programming," Grace Hopper was one of the most important computer programmers in the pioneering era of computing. 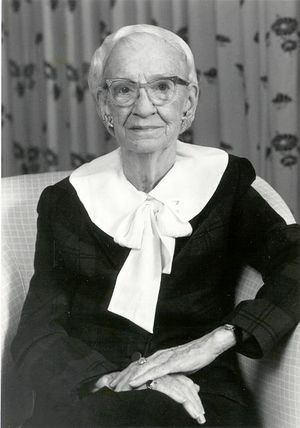 Born Grace Brewster Murray in New York City, she received a bachelor’s degree in mathematics and physics from Vassar College in 1928 (Phi Beta Kappa). Hopper earned a master’s and doctorate in mathematics from Yale in 1930 and 1934. After returning to Vassar as an instructor from 1933 to 1943, Hopper decided to join the America military’s World War II efforts. She joined the Navy WAVES (Women Accepted for Voluntary Service) program in December 1943 and was commissioned a lieutenant early the next year, taking an assignment at the Bureau of Ordnance Computation Project at Harvard University. After the war, Hopper stayed on as a research fellow at the Harvard Computation Laboratory. 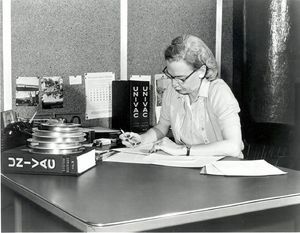 In 1949, she went to work for the Eckert-Mauchly Corporation, and in 1952, became Director of Automatic Programming for the UNIVAC Division of Sperry Rand (which had acquired the Eckert-Mauchly company). Hopper was one of the originators of high-level programming languages, completing one of the first compilers in 1952. At Harvard, Hopper became involved in the later stages of the construction of the U.S. Navy’s Harvard Mark I computer, which was co-sponsored by the IBM corporation. She also worked on the later Harvard Mark II computer. Working on these machines, Hopper became one of the first computer programmers, beginning a long career in this field. She would eventually write several widely-adopted, influential programs. Five years later, she completed a compiler for FLOW-MATIC — the first compiler for an English-language business data-processing language. FLOW-MATIC had a large influence on COBOL, which became the most widely used programming language for business applications. Hopper was one of the early members of the Association of Computing Machinery (ACM). In 1957, she edited the ACM Glossary of Computing Terms — the first authoritative dictionary of computing. Although not as important as the programming work which earned her the nickname “Amazing Grace,” Hopper is also remembered for a humorous incident involving a “bug” in a computer system. Once when the Harvard Mark II was malfunctioning, she discovered that one of its electromechanical switches had jammed when a small moth had gotten stuck in it. Where the moth came from, nobody knew, but she removed its dead body, taped it into her logbook, and wryly noted that she had found the “bug.” Although using the term “bug” to describe a technical problem dates from the nineteenth century, Hopper is remembered as the first to identify a literal computer bug. 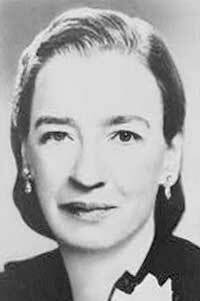 Hopper’s later career was spent working for J. Presper Eckert and John Mauchly (creators of ENIAC) at the Eckert-Mauchly Computer Corporation, which she joined in 1946. She remained at this company (although it was absorbed into the Remington-Rand Corporation and later the Sperry-Rand Corporation) until her retirement in 1971. Hopper had remained a member of the Navy Reserve, and in 1967, the Navy recalled her to active duty. There she worked on various computer-applications, and led the effort to standardize programming languages for the military. She eventually attained the rank of real admiral, and when she retired in 1989 at the age of 79, she was the oldest serving officer in all the armed forces. In 1962, Hopper was named an IEEE Fellow "for contributions in the field of automatic programming." in 1980 she became an IEEE Life Fellow. In 1991, President George Bush presented her with the National Medal of Technology "for her pioneering accomplishments in the development of computer programming languages that simplified computer technology and opened the door to a significantly larger universe of users." She received some 40 honorary doctorates, and a U.S. warship was named in her honor. She continued to work as consultant until her death on New Year's Day in 1992. Grace Murray Hopper was buried at Arlington National Cemetery, Arlington, Virginia, with full Navy ceremony. In January 1996 the U.S. Navy christened a destroyer in her honor, the U.S.S. Hopper. This page was last edited on 26 January 2016, at 19:01.